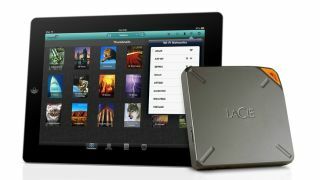 Lacie reckons it has a solution for all those people who look at the storage of their iPad and exhale a tiny mew of disappointment. The storage giant has announced the Fuel - a wireless hard drive for iPad, iPhone and Mac which requires no internet connection and can boost your storage to a meaty 1TB. The drive works by creating its own little Wi-Fi hotspot for your device to connect to and also can link up to the internet itself if that's available. The drive also boasts AirPlay compatibility to allow you to stream your content to speakers or an Apple TV. This device is the first collaboration with another storage giant Seagate, and uses its free Seagate Media app to give access to the files. It's Dropbox compatible and also has a USB 3.0 port for physical transfers and boasts a 10-hour battery life, and it's available 'soon' for around £170.